The world's best way to blast your back and arms without a spotter but within a small footprint. .. The unique Legend 3225 Pro Series Prone High Row allows the user the hit the upper/mid back, rear.. Rack Ramp Rack ramp design of FreeMotion military press facilitates easy loading onto front b..
Keep your quad pistons pumping with the Legend 3122 Angled Leg Press! Start with a frame construc.. Looking like a menacing praying mantis that wants to give you massive lats, the 6005 is the large..
Take our already outstanding seated preacher curl with its welded construction, correct geometry .. Results are the answer when you bring on the Seated Calf. A must for building and strengthening t.. Lean back on the 35° angle pad of the Legend Fitness 3123 Hack Squat and prepare to lift off. Rel..
Get all the benefits of a converging chest press but in a smaller footprint. No need for a spotte..
Lat work is everything it's supposed to be with the Incline Lever Row. This simple design drastic.. 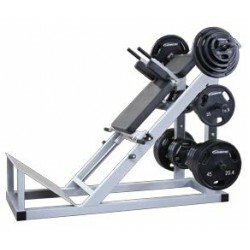 Updated and improved for 2009, our Legend 3224 Leg Press & Hack Squat Combo machine gives you.. The eighth member of our new LeverEDGE line is here, and it's unlike anything you've ever seen. T..
Lat work is everything it's supposed to be with the Legend 3110 Incline Lever Row. The Incline Le.. This is the story of this device's development from the man himself, Louie Simmons: "I was do..